Summary: This is the second book in a series, so please be forewarned that this review contains spoilers for book 1, An Ember in the Ashes. You can read my review for that here. Picking up right where Ember leaves off, Laia and Elias are now the Empire's Most Wanted. They're both supposed to be dead, but instead, they are now escaping through the tunnels underneath Serra, with the Commandant, the Masks, and the new Blood Shrike - aka, Elias' best friend Helene - hot on their heels. Laia and Elias have a treacherous journey ahead of them as they attempt to travel to Kauf prison, to break out Laia's brother Darin, whom may or may not even still be alive at this point. Along the way, not only do they have to dodge the entire Empire (Martials, bounty hunters, etc), but apparently some otherworldly beings are after them as well, with some alarming consequences. A new narrator for this book, Helene Aquilla has sworn fealty to the cruel new Emperor, Marcus Farrars, and her first mission is to hunt down her best friend - and the boy she's been in love with her whole life - Elias, who has abandoned the Empire (and her) to help a Scholar slave. As the Empire she has sworn to serve starts to crumble around her, she begins to realize that there are much greater, darker forces at work, and she must decide where her loyalties lie and what price she's willing to pay. Thoughts: *exhales forcefully* WELL. I put off reading this one for a while because I wanted to reread the first book, and if you remember from my review, it took me a while to work up the nerve to read the first book because it's incredibly brutal and violent. But once you get over that (can you ever really "get over" that?) 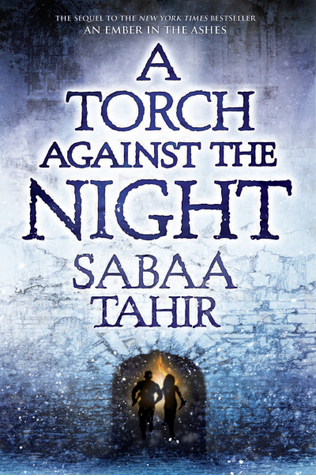 it was a truly incredible story of hope and survival, and in that respect Torch was no different. This second book dealt a lot with consequences. A lot of things were set in motion in the first book that the characters have to deal with now, and again I found myself reading with gritted teeth, because at every turn, the odds seemed stacked against our two (well, now three) heroes. This is not a fuzzy story of meet-cute, you guys. (Though, I will continue to ship Laia and Elias until the bitter end.) The evil people in this story are pretty evil. We meet some new characters, good and bad, in this one. Helene we already knew, but this time, she's part of the rotation of narrators, and she's pretty frickin' amazing. Her new right hand man has some surprising secrets to reveal by the end of the book, and I'm curious to see where that all goes. And that's one of the lessons of this book, as well. Laia and Elias repeat it over and over - "Where there is life, there is hope." At any moment, anyone could do a surprising thing and change the course of events. I mean, for some characters, it's less likely than others, but still. It could happen. And the surprises are what got me through this entire book in one damn day. I couldn't stop. I know we have at least two more books to go in this series, and I can't wait to see where it all goes.